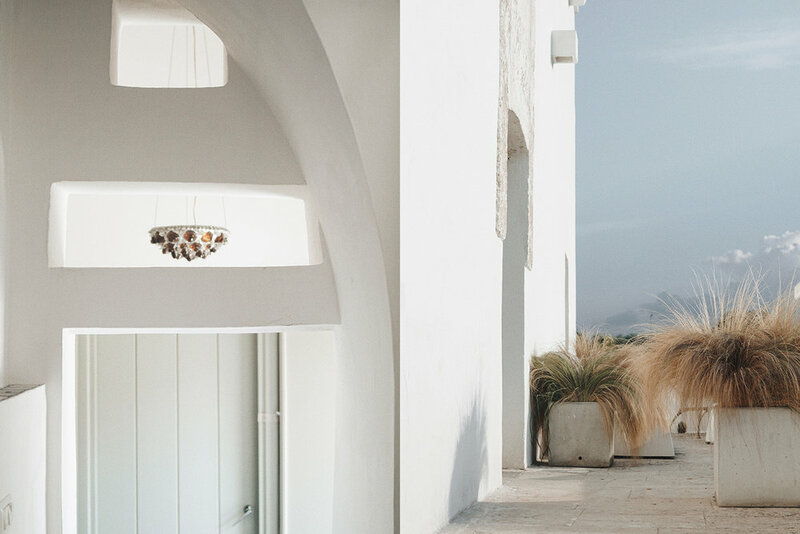 Located in the serene countryside of Puglia just off the Adriatic Sea is the minimalist boutique hideaway, Masseria Alchimia. Once owned by nuns, the oldest part of the masserie is from the 17th Century, and was a school for young girls. Purchased by owner Caroline Groszer in 2006, she transformed the hermitage into a rural retreat with 10 beautiful self-catering apartments that are furnished with a mix of vintage and contemporary pieces and feature art works of painters and photography by the owner herself. 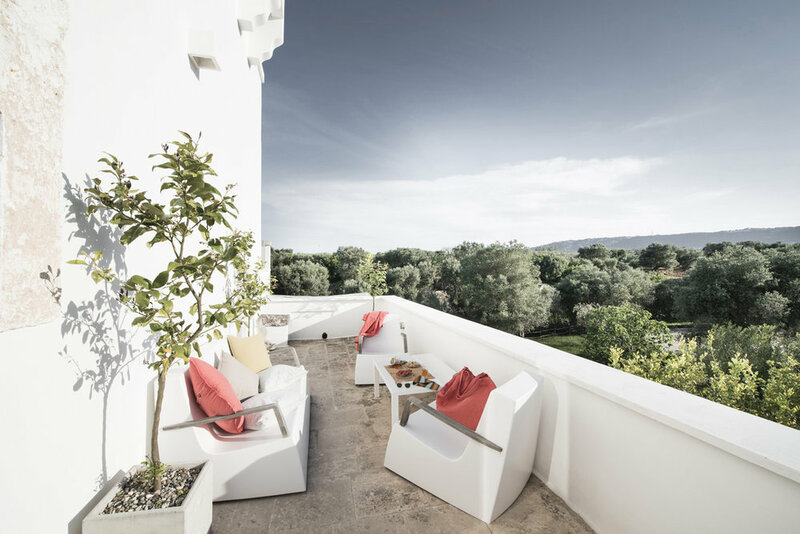 Ideally situated close to cities and holiday attractions, one can choose to explore the area or simply cocoon away and enjoy the ancient olive groves and gardens surrounding the tranquil hideaway. All 10 self-catering apartments are fully furnished and feature a kitchenette, bathroom, TV, wifi and a safe. Each of the 10 studios differ in size and layout, with independent entrances and some with a private terrace while others have a garden space. The white walls and poured concrete floors in the rooms create a neutral palette for the selection of vintage and modern pieces with a combination of deep warm colors and materials. One of our favorites is the Deluxe Suite, which is the largest studio, sleeping 2-3 people, and has a dining room, bedroom and rear terrace with a hot tub built into the craggy hillside. Surrounded by ancient olive trees, this setting is quiet and private, yet is close to other cities, beaches and areas of interest, making it an ideal hideaway for those that want to experience something more remote with all the conveniences. Located 50km between Bari and Brindisi Airports. Breakfast is not included, but there is a nearby farm for natural organic foods (pasta, homemade bread, olive oil, local cheese) and the neighbors Masseria Monte and Masseria Lama di Pecora serve food as well as the Minimarket “Da Franco”. Located just 5 minutes from the beach, there are beach clubs, restaurants and public beaches to enjoy. 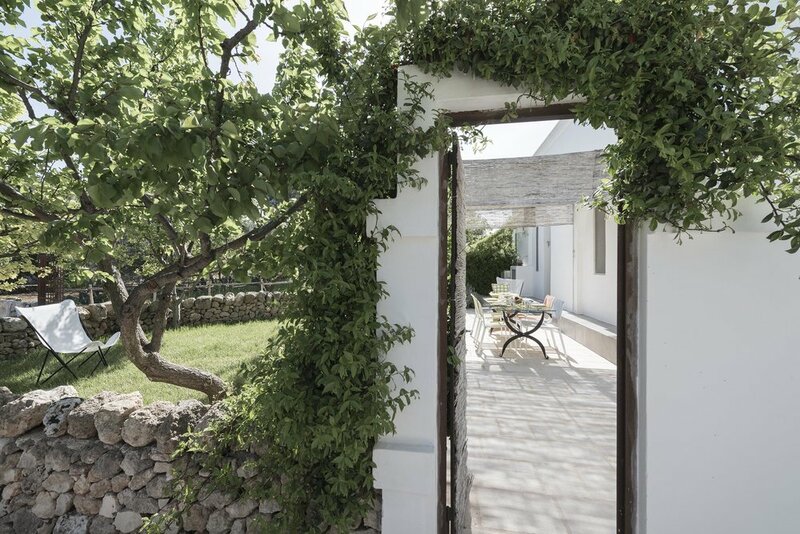 Masseria Alchimia has an arrangement with White Beach Club, and with Lido di Bambù where Masseria Alchimia’s guests get special rates when renting beach chairs and umbrellas. Golf - San Domenico Golf course and Coccaro Golf Club are nearby. Caroline can help with arrangements for horse riding, tennis, a cooking course, pilates/yoga/massages, airport transfers and other services. *photos courtesy of the property and Miren Alos.